Introducing this new section: the hardhat. Curious about what goes into opening a restaurant? Each month we'll be checking in on the build-out process of flour + water, a new restaurant project that is underway in the Mission. 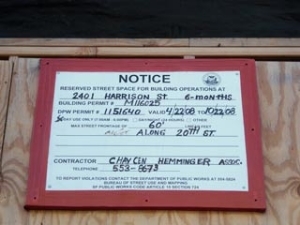 The hardhat will highlight the unique coups and complications when opening a restaurant in San Francisco. This section will be written by Erin Archuleta, tablehopper intern and half of the talent behind local outfit Ichi Catering. Few restaurant purchases in San Francisco are turnkey endeavors, but some less decidedly so than others. David Steele, financier and Mission resident, and David White, a restaurateur who was most recently behind Nua in North Beach, have completely overhauled the former Mi Mazatlan Restaurant to create their own pizzeria, osteria, and enoteca: flour + water. Instead of hipping-up the old place, they have culled the city for pre-existing good fits to create an ambiance they feel will not be overly designed. They are eager to create a space "of the neighborhood, for the neighborhood." The historic building befits the green idea of reuse. From kitchen items to unique décor, they've sourced the best bits for their diners. Even the espresso machine is one that David White built by hand and brought with him from his last restaurant. Their new big-ticket item will be a Mugnaini wood-fired oven. This build-out is expected to go through the spring. And so far, only rough plumbing and electrical have gone in. For more details on the project, you can read the original tablehopper chatterbox posting about it back in July. Sean Quigley, of Paxton Gate fame, joins them in creating a unique look for their neighborhood spot. In hiring Sean, they are looking for a place that resemble Sean's aesthetic--the fantastic meeting the natural that Missionites have come to love and claim. While discussing the façade, Sean talked about needing a mural. David S., inspired at the thought of connecting with the local art community (as a board member of ArtSpan, he has a built-in network of over 800 artists! ), decided to host a contest for local artists to showcase their work. Artists are encouraged to create something that embodies the neighborhood as well as the nuances of the restaurant. The chosen mural should capture the theme of the restaurant: organic, natural science, patina, or reclaimed. Due to limitations within the space, the media must be restricted to painting. Besides having the honor of painting this mural, the winning artist will receive a sponsored registration for SF Open Studios 2009 AND a complimentary full-color, full-page ad in the 2009 SF Open Studios Guide. The deadline for this call for entries is November 31st, 2008 at 5pm. The winning artist will be notified by January 18th, 2009. Questions? Contact Jennifer Mullen at jmullen [at] artspan [dot] org and include "Mural Project" in the subject of the email. We'll be back next month with more news and an update on the project!